Thank you for your letter! I want you to know that you guys are all totally awesome. Your questions are really good questions. I will try to answer them as best I can. How did myths and legends begin? Myths and legends are kinds of story. Stories are very old. The experts who study stories are called folklorists. People who tell stories are called Storytellers. Folklorists often can’t work out how old stories are. The most famous Storyteller in our country is probably Ben Haggerty. He told me about a really interesting project he is doing with some Folklorists. They are trying to find the oldest stories in the world. They are doing this by finding the stories that have NO complex inventions in them. If a story has a sword in it, for instance, it must have been made up AFTER swords were invented. If a story has bread in it, then it must have been made up AFTER bread was invented. If a story only has people in it, and they don’t use any inventions, then perhaps that story is older than most inventions. However, no story can be older than talking – because talking is how we tell stories. So how old is talking? Well, no one knows the answer to that either! Archaeologists are the people who study very old objects. Archaeologists have worked out that the oldest ever invention is a stone axe. Neurologists are scientists who study the brain. Brain scientists did some work with Archaeologists, and together they decided that language (talking) is probably about the same age as stone axes are. They think that when people became clever enough to make an axe, they were probably clever enough to talk. Stone axes are around 2 MILLION years old. That is a long time ago! Even just to count to 2 million would take around 46 days, and that is if you didn’t take any breaks to eat or sleep! 2 million YEARS old, imagine! But after a while they probably started telling stories. How long a while? No one knows. 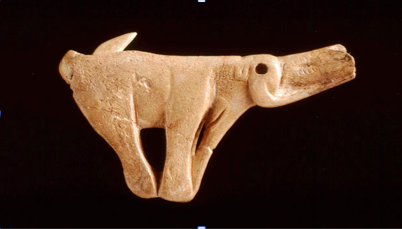 Around 50,000 years ago though, people started making art. They made sculptures and did drawings on the walls of caves. The people who made this beautiful art were DEFINITELY clever and creative enough to tell stories. So my final answer to this question is: between 2 Million and 50,000 years old! 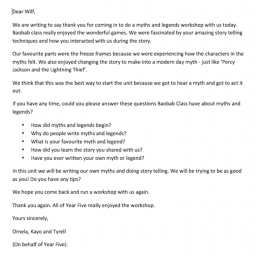 Why do people write myths and legends? This is a truly fantastic question. Well done to whoever thought of this. The people who try to answer this question are called Anthropologists. I have studied Anthropology at university. Anthropology is about finding out why people do the things they do. Some legends are true, and some are probably made up. Most are probably a mix of true stuff and made up stuff. Anthropologists don’t really care if a legend is true or false, instead they care WHY people like them so much! There is no one answer to the question of why people tell myths and legends, instead, there are many answers. Here are some I thought of. – To not be scared. For instance if you are scared of tigers you could make up a story about a tiger and then make it so a brave warrior defeats the tiger. Telling this story might help you deal with your fear. – Express their ideas about how the world works, or how people work. – Explain why something happens (like why the sun travels through the sky for instance). – Relax (the TV is only a robot storyteller). – Remember how to do something important. Instructions can be super hard to remember, but stories are easy to remember. So if you need to remember a list of instructions, simply put them in a story! Some legends might explain how to catch an elephant for example, or how to collect honey in the forest. – Make them feel together. Here is an example of how stories can make people feel they are together. You are called Boabab class. You might say to Mimosa class: “Boabab class is WAY the best, because when we went to the British Museum, all the stuff came alive, and we had to fight off the Egyptian Mummies with some stone axes.” Telling this story would remind you that you are in Boabab class and that your class is really pretty cool. Can you think of any more reasons people tell myths and legends? What is your favourite myth and legend? Oooooo that’s hard. I think my fave old old myth or legend is the Indian legend ‘The Mahabharata’. It is the longest story in the world. It is actually thousands and thousands of little stories all tied together. The main part is about 5 brothers who all marry one woman called Draupadi. Together they go off on a massive adventure. How did you learn the story you shared with us? My dad used to tell me that story when I was a child. He used to tell me and my sisters and brothers stories in the car. He was probably only doing it to keep us quiet, but man we loved them! Write down the ‘bones’ of the story. This means the most important parts of the plot. 1. Prophesy says that king Acrysus will be killed by his grandson so he locks Danae in a tower. 2. Zues makes Danae pregnant and she gives birth to Perseus. King Acrysus throws them into the sea. 3. Dictus looks after them, and Perseus grows strong. 4. Polydictus kidnaps Danae. Persius says he will bring Medusa’s head. 5. Perseus gets three magical gifts: A shiny shield, flying sandles, and an invisibility cap. 6. Perseus uses his gifts to get Medusa’s head. 7. Perseus turns Acrysus and his soldiers to stone. 8. Perseus becomes an Olympian and accidently kills Acrysus with a discus. Draw a little picture for each bit of the story. You can put the pictures out on a kind of map. When you want to remember the story, you don’t need to read it again, you can just follow the path around the map and the pictures will remind you of all the important bits. This is called a story map. Practice telling the story. Every time you tell it you get better. Every time you tell it add more description. Tell people about the snakes in the Gorgon’s hair. Tell them about how the food tastes. Tell them how the characters are feeling. Practice on a friend first, then when you know you can tell it to a friend try telling it to your whole class. When you have told it to your whole class you can tell it to the whole school. Once you have told a story to a whole school you are ready to tell it to the whole world. 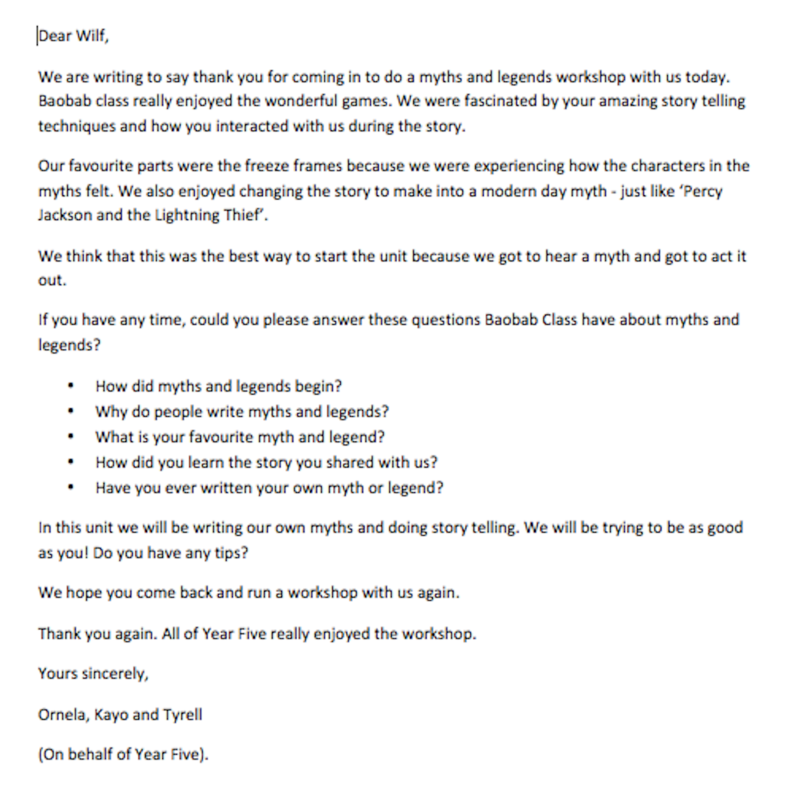 Have you ever written your own myth or legend? Every time you tell a story you change it a bit. You add your own details and descriptions. You interpret it in your own way. I have done lots of interpretations of stories. So far I have only made up one myth or legend myself. – legends are about adventures and they have heroes. – myths are about How, or Why things happen. Interested? I can send you one when it is finished. I want to make up some more legends. Having the ideas is quite hard though. Writing them is hard too. You guys seemed pretty creative, give me some ideas! Actually, I’ll tell you what: if you write me a legend, I will come to your school and tell it back to you.